There are three active churches in the district and one derelict. A much earlier chapel that was being maintained by the men of Templeton is also recorded and in a dispute dated 1386 the men of Templeton appealed against having to support Narberth church as they were supporting the church in Templeton. A reduction was granted to Templeton by the clerk of St Davids. This early chapel is thought to have been on the site of St John's church. 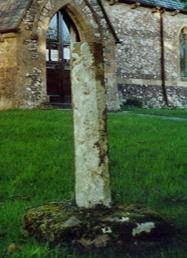 The base of a cross was discovered in the garden of a house further up the hill and it is believed to be the base of the cross from the earlier church. The Congregational Church was originally built in 1818 but destroyed by fire and re-built in 1838. This chapel is now a United Reform Church. The branches of the Monkey Puzzle tree can be seen guarding the churchyard. St Johns Church was built in 1859 by Mr Richards who was the great grandfather of one of Templeton’s older villagers. The architect was J.Seddon of Llandaff. The service of consecration was held on 25 June 1862 and this year (2012) St Johns celebrates it's 150th anniversary. A special service has been arranged for 10th June 2012 to commemorate the 150 years. The Bishop of St Davids is to attend the service. Molleston Baptist Church is a mile from the village centre and was first recorded in 1667 although the current building was not built until 1736 it has undergone several renovations since then. It is the oldest English Baptist church in Pembrokeshire. Mounton Chapel is situated on the edge of the village boundary and is now derelict. It was first mentioned in the 13th century as serving the hospice of St Mary’s at Llawhaden Castle. It is believed to be built on the site of a pre Christian Celtic church.